At first blush, the new desk seems much like my old desk. I acquired an Ikea corner desk about a decade ago, including the semicircle extension upon which the LG 4K monitor sits in the photo above. I’ll direct your attention to the keyboard tray in the lower right corner. The keyboard dray does not retract; it rotates. It’s always irked me, but this particular Ikea design made it nigh on impossible to install the slider necessary for a retractable keyboard. The other annoyance is purely my fault: I installed the keyboard tray slightly off center. That always bugged me. What you really can’t see is the two drawer, HON steel file cabinet upon which the soda can rests. Let’s take a look at my new desk. The new desk is actually older than the old desk. The new desk is also a corner desk, and is technically older than the old desk; my wife used it in her home office for longer than I owned my corner desk. And it came at a great price: free. When some neighbors moved, they gave us the desk. It’s also an Ikea design, but older, and users much heavier gauge steel in the legs and bracing. However, ample room exists underneath the desktop to install a slider. So this desk includes a retractable keyboard tray — and it’s properly centered on the curve. I chose not to install the semicircular extension, and I removed the file cabinet. My floor-standing PC tower now sits somewhat exposed, so I’m careful to put coffee cups on the right side now. 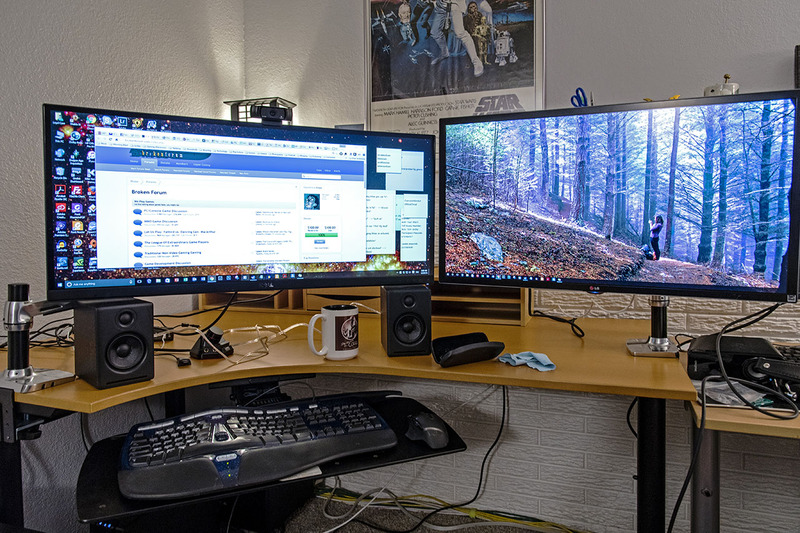 I can also now use the Ergotronic monitor arms with both my displays, which allows much more flexibility, particularly with the height adjustment on the Dell U3415W. 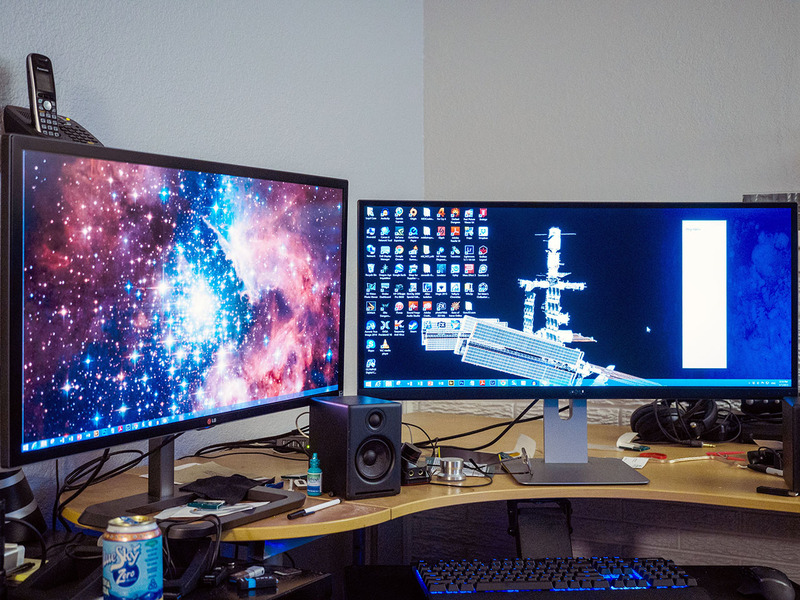 The 4K LG monitor now resides on the right side, and overlaps the adjacent desk. It’s not a big deal, though, as that desk is used just for Friday night gaming, and I can rotate the LG monitor out of they way. 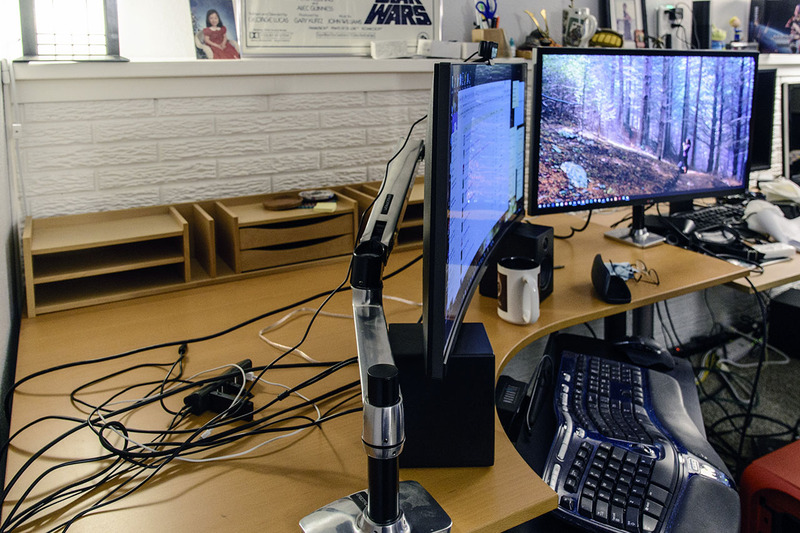 The Ergotron flexible monitor arm makes life much easier. 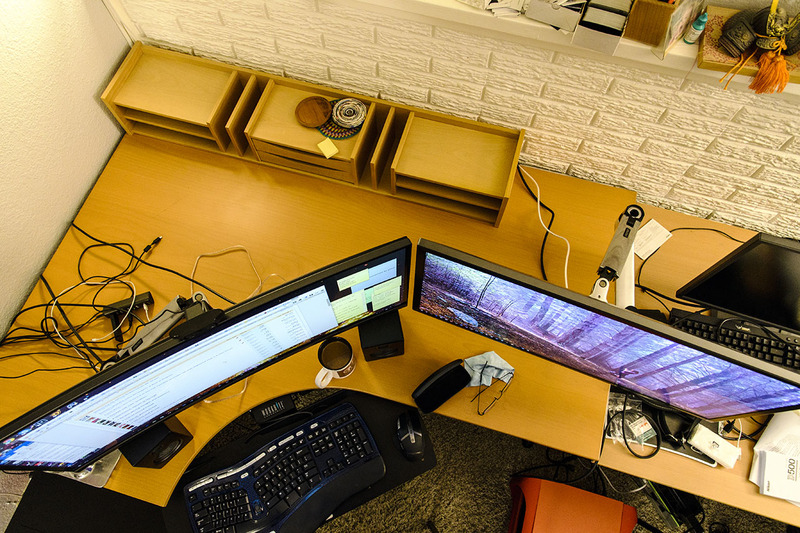 Looking at a top-down view, you can see how the monitor arms clears a ton of space. I’ve also appropriated the desktop storage accessory which my wife used to use. Jan’s moved upstairs, and now has a smaller desk more suited to the retired life. Meanwhile, I’m looking for a home for the old desk. So I’m pleased with my new-old desk. The more flexible display setup coupled with the better keyboard tray makes the whole affair more ergonomic. Since I spend too much time at my desk as it is, making it a bit more body-friendly will be a good thing.